Infant AsthmaWhat is Infant Asthma? It’s a type of illness that occurs during infancy. This respiratory disorder is known for the reduced ability to take in a deep breath. Asthma involves constriction and inflammation of the lung airways. It is usually based on genetics and triggered by environmental factors. It’s important for parents to know the symptoms. It usually presents itself differently in babies and has less severe symptoms than in children. The most common symptoms are wheezing, coughing, and rapid breathing. Also look for things like poor feeding and poor sleeping. If your infant makes strange noises after playing or eating, it is a sign that something is wrong. Breathing difficulties cannot always be verbalized by your young one. Perhaps, look to see if your infant is restless and not feeling comfortable. Your infant’s breathing may slow down as each breathe become laborious and exhausting. Always closely monitor for any change in color in the lips or fingernails. Why are Some Infants and Toddlers More Susceptible to Getting Asthma? The process just described can be normal, up to a point. Everyone's airways constrict somewhat in response to irritating substances like dust and mold. But in a person with asthma, the airways are hyperreactive. This means that their airways overreact to things that would just be minor irritants in people without asthma. To describe the effects of asthma, some doctors use the term "twitchy airways." This is a good description of how the airways of people with asthma are different from those without the disease. Not all patients with hyperreactive airways have symptoms of asthma, though. We still do not know what causes some people to develop asthma. Research shows that a family history of asthma or allergies, a specific allergy in the child or cigarette smoking during pregnancy may increase the likelihood that a person will develop asthma early in life. One of the most common causes of asthma symptoms in children five years old and younger is a respiratory virus. Although both adults and children experience respiratory infections, children have more of them and some preschool children are plagued with viral infections. 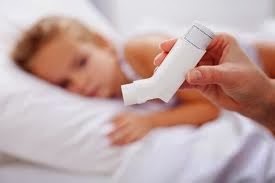 At least half of children with asthma show some sign of it before the age of five. Viruses are the most common cause of acute asthma episodes in infants six months old or younger. Your doctor is your best source to find out what is ailing your infant..This illness is difficult to diagnose because the symptoms may be hard to notice or confused with other diseases. To prevent lung damage, infants with respiratory issues should see a medical professional as soon as it is possible. This will help prevent lung damage and any other serious problems. Other similar respiratory problems, like congenital heart disease, bronchitis, and pneumonia, can bring about asthma-like symptoms and need to be excluded. Only a trained medical professional can tell the difference. The best way to prevent episodes is to prevent triggers that can bring upon attacks. The most common triggers are infections, smoke, dust, pet dander, mold, and pollen. They tend to fill the lungs with foreign particles that your infant’s immune system may response to. Keep a list so that you can discuss it with your infant’s doctor. How is Asthma Diagnosed in Babies and Toddlers? Diagnosing asthma in very young children is difficult. Since they are not able to communicate, they cannot describe how they are feeling. A baby's fussy behavior could mean many things; however, toddlers and preschoolers often continue to be fairly active in spite of increasing chest tightness or difficulty with breathing. To help the pediatrician make a correct diagnosis, parents must provide information about family history of asthma or allergies, the child's overall behavior, breathing patterns and responses to foods or possible allergy triggers. Lung function tests often used to make a definitive asthma diagnosis are very hard to do with young children. Instead, the physician may see how the child responds to medications to improve breathing. Blood tests, allergy testing and x-rays may be done to gather additional information. Using all this information, the doctor then can make the best diagnosis. Parents may be referred to a pediatric allergist or pulmonologist (lung specialist) for specialized testing or treatment. As a parent, you have to watch carefully for changes in your infant’s condition. Your infant may not sleep well on nights that he or she has breathing difficulties. Babies who have asthma frequently do not feel well so that don’t feed or sleep as well. Additional signs that breathing is a struggle are flaring nostrils, the use of abdominal muscles to breathe, or having to stop crying to catch a breath. When an infant has serious difficulty breathing, you should see a doctor as soon as possible. If you suspect that your infant is in distress, seek emergency care right away. Emergency medical treatment is necessary if the infant is struggling to breathe as indicated by the sides pulling inward, an unusually high rate of breathing, or heavy sweating. There are many medical treatments and natural remedies to control this illness and keep symptoms at control. This medical condition tends to weaken the young immature lungs of young babies and make it vulnerable to other illnesses. Gratefully, asthma symptoms can be controlled with the correct kind of asthma treatment. With a good management plan your baby can breathe normally.